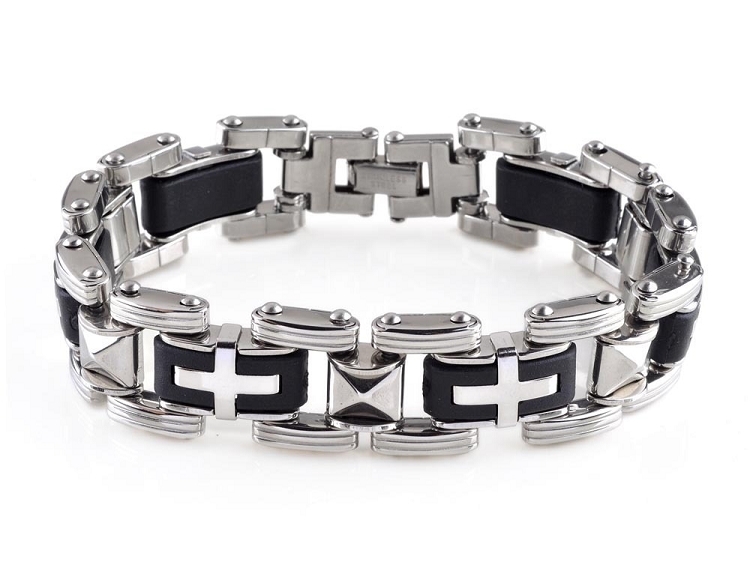 This fantastic looking black Men's stainless steel bracelet has a unique signature cross pattern. This measures 8.5" long and about 9mm thick. Very light and comfortable for the hot summer months. As always, free shipping and gift box provided! Q: do the mens bracelets come in various sizes? The bracelet is 8 1/2" long by 1/2 " wide and is very well made. The links are smaller than pictured which actually gives it a more streamlined look. The simplicity of the design makes it visually attractive. The price is more than reasonable for a quality product. Customer service was outstanding and I recommend this seller without reservation. First, Tungsten's customer service is second to none. The clasp broke on the original bracelet I ordered (not this one) and they sent this one out immediately just from a phone call. I would definitely recommend this seller. This bracelet's clasp is much stronger and the bracelet itself is very nice. Great value for the price. This bracelet goes well with my black and white attire. The silver accents of the bracelet stands out. I enjoy wearing it! It looks really nice, I can wear this with anything from dressy to casual. My grandson loved the bracelet! I highly recommend this site! We needed a special present last minute and Damien was great getting the bracelet to us in time! The quality of the bracelet was wonderful and at this price!! Thanks again! !